University of Texas Rio Grande Valley's Nichele Hyman (15) yells out as she passes the ball against CSU Bakersfield in a WAC conference game at the UTRGV Fieldhouse Thursday, Jan 11, 2018, in Edinburg. 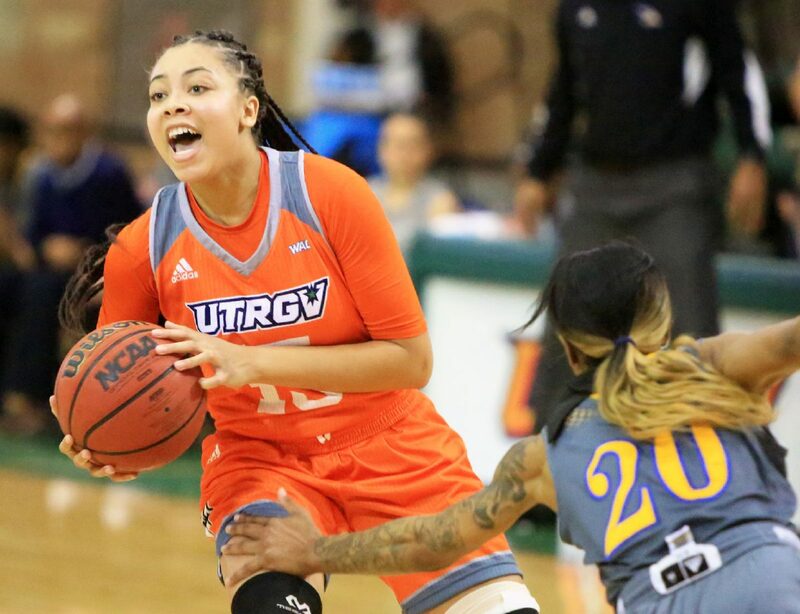 EDINBURG — When the UTRGV women’s basketball team took possession of the ball trailing by three in the final 10 seconds of overtime, point guard Valeria Tapia was confident. After all, just a few minutes earlier, her team had erased a five-point deficit in the final 15 seconds of regulation to force the extra period. Idil Turk’s 3-pointer off an inbounds pass missed, allowing CSU Bakersfield to pull out a 67-64 win on Thursday at the UTRGV Fieldhouse. 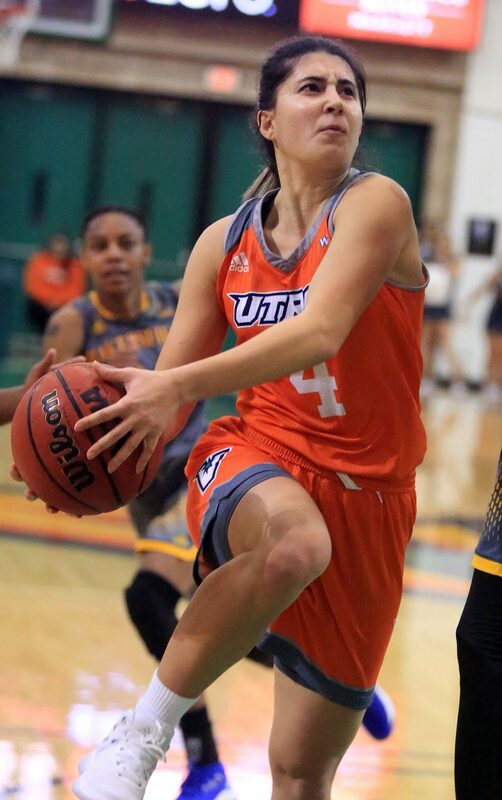 University of Texas Rio Grande Valley's Idil Türk (4) drives to the basket against CSU Bakersfield during overtime play in a WAC conference game at the UTRGV Fieldhouse Thursday, Jan 11, 2018, in Edinburg. University of Texas Rio Grande Valley's Laura Van Tilburg (44) fights for position under the net against CSU Bakersfield's AlizŽ Lofton (21) in a WAC conference game at the UTRGV Fieldhouse Thursday, Jan 11, 2018, in Edinburg. University of Texas Rio Grande Valley's Valeria Tapia (10) drives to the basket against CSU Bakersfield in a WAC conference game at the UTRGV Fieldhouse Thursday, Jan 11, 2018, in Edinburg. 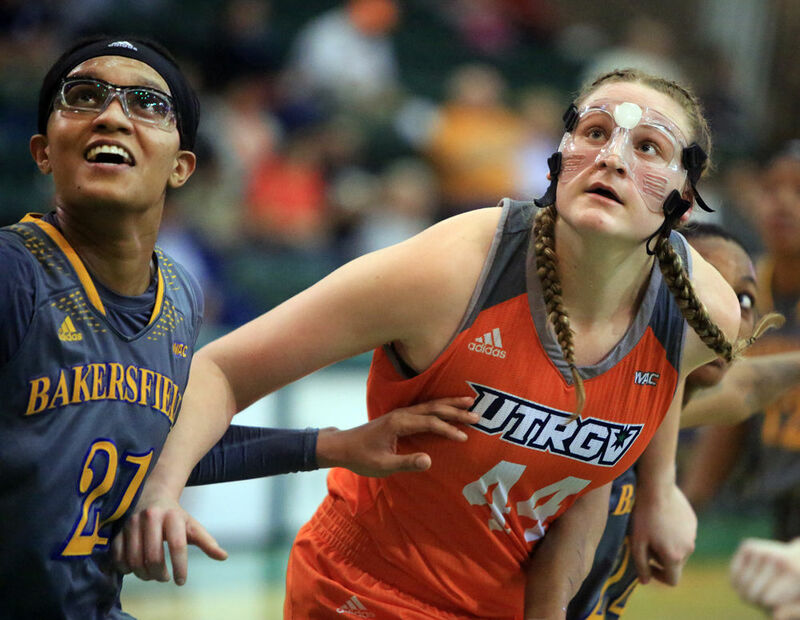 After the closing spurt to tie at the end of regulation, UTRGV was held without a basket until the final minute of overtime. 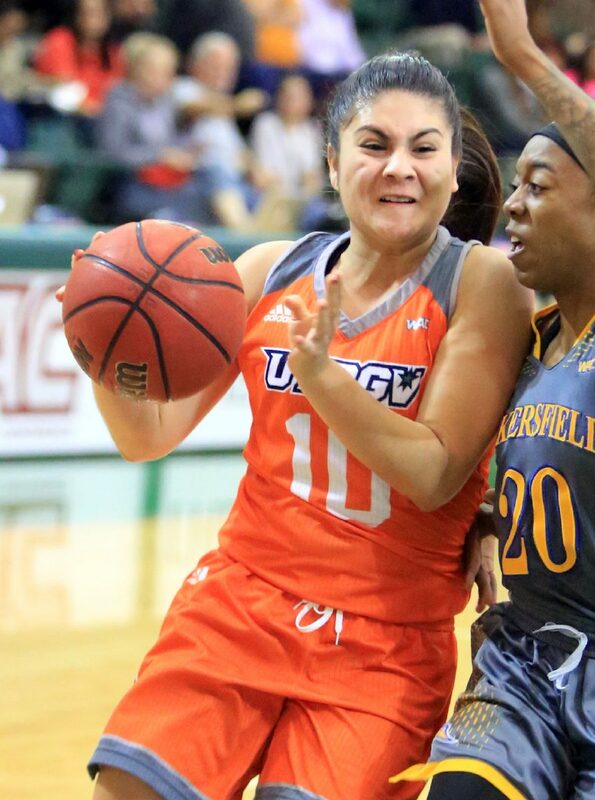 For the game, UTRGV hit 20 of 60 shots (33.3 percent) with 22 turnovers against an aggressive Bakersfield defense. UTRGV led by as many as 12 points in the first half before Bakersfield took the lead with 1:07 remaining in the third quarter. That edge grew as large as 8 with 3:33 to play as Bakersfield started to find its shooting touch. The Roadrunners missed their first 15 shots from beyond the arc before connecting on five of their next nine. But UTRGV hung tight, then mounted a rally in the closing seconds. After Bakersfield’s Aja Williams hit two free throws to stretch Bakersfield’s lead to five with 20 seconds to play, UTRGV’s Krisynthia Sampson hit a 3-pointer from straight on with 14 seconds remaining. Tapia came up with a steal on the ensuing inbounds pass, then fed Nichele Hyman for a jumper at the free-throw line to tie the game with 7.7 on the clock. Despite the late spark, Bakersfield scored the first six points of overtime to build a 64-58 advantage with 2:09 to play. That lead was still four in the final minute before Turk had a 3-point attempt blocked but recovered her own miss and drove for an off-balance layup to pull UTRGV within 64-62. Bakersfield hit two free throws, and Samson answered with a layup to pull UTRGV within two with 24 seconds on the clock. The Roadrunners then missed a pair of free throws with 10 seconds remaining, but Sampson was whistled for a loose-ball foul after the second miss, sending Williams to the line for Bakersfield. She hit one of two to set up UTRGV’s final possession. Vaqueros players and coaches were animated in arguing the call against Sampson. Van Tilburg, a Weslaco native, finished with a team-high 20 points and eight rebounds, while Hyman added 13 points, albeit on 4-of-14 shooting, in her second game back from a concussion that cost her the entire nonconference season. Eight other UTRGV players appeared in the game, but none of them reached double figures in scoring. With the loss, UTRGV drops to 0-2 to start the WAC season, which continues at 7 p.m. Saturday against Grand Canyon. Chicago State is the only other WAC team sitting 0-2 to start conference play.